Stem cell treatments are a type of intervention strategy that introduces new cells into damaged tissue in order to treat disease or injury. 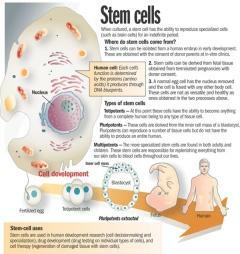 We believe that stem cell treatments have the potential to change the face of human disease and alleviate suffering. [The ability of stem cells to self-renew and give rise to subsequent generations with variable degrees of differentiation capacities,offers significant potential for generation of tissues that can potentially replace diseased and damaged areas in the body, with minimal risk of rejection and side effects. Stroke and traumatic brain injury lead to cell death, characterized by a loss of neurons and oligodendrocytes within the brain. Healthy adult brains contain neural stem cells which divide to maintain general stem cell numbers, or become progenitor cells. In healthy adult animals, progenitor cells migrate within the brain and function primarily to maintain neuron populations for olfaction (the sense of smell). Interestingly, in pregnancy and after injury, this system appears to be regulated by growth factors and can increase the rate at which new brain matter is formed. Although the reparative process appears to initiate following trauma to the brain, substantial recovery is rarely observed in adults, suggesting a lack of robustness. Stem cells may also be used to treat brain degeneration, such as in Parkinson's Disease , Cerebral Palsy , Motor Neuron Disease , Stroke & Spinal Cord Injury .